It somehow seems appropriate that the acquisition by the State of Maryland of many of Baltimore’s most important artifact collections would occur during April — Maryland’s Archaeology Month. These collections, which were generated through the work of the Baltimore Center for Urban Archaeology, will be curated by the Maryland Archaeological Conservation Laboratory (MAC Lab) at Jefferson Patterson Park and Museum. A privy filled in the early 19th century at the Clagett’s Brewery site (18BC38) yielded 432 ceramic and glass vessels, including this unusual scratch blue pearlware chamberpot bearing the initials of England’s King George. The formation of the Baltimore Center for Urban Archaeology in April of 1983 was arguably the single most influential action affecting archaeology in the city. Baltimore mayor William Donald Schaefer, impressed by the Archaeology in Annapolis project, decided that a similar program was needed to promote heritage tourism in Baltimore. Mayor Schaefer envisioned excavations as a way, through the media and public visitation, of promoting Fallswalk, a new historic walking trail along Jones Falls. In establishing the Center, Schaefer instituted the first public archaeology program ever funded by a major U. S. city. Over the next fifteen years, the Baltimore Center for Urban Archaeology conducted historical research on 53 city properties, resulting in 21 excavations. Some of the most important projects included the Clagett Brewery (18BC38)—one of Baltimore’s earliest breweries—along Jones Falls, and Cheapside Wharf (18BC55), where the Inner Harbor is located today. The center’s work generated around 500 boxes of artifacts—collections that have revealed important evidence about the city’s past and its important role as a port city. Elizabeth A. Comer directed the BCUA from its inception in 1983 until 1988, when she left to work in tourism in the Schaefer administration. Upon her departure the direction of the BCUA was shared by Kristen Stevens Peters and Louise Akerson. Louise, who had been the BCUA’s Lab Director since 1983, assumed overall direction of the BCUA when Kristin left in 1990, and continued in that role until her retirement in 1996. Esther Doyle Read was the final director of the BCUA until it was dissolved, along with the City Life Museums, in 1997. The collections generated through the center’s work were acquired by the Maryland Historical Society. For the next twenty years, the collections and the records associated with the excavations were unavailable to researchers and students. Negotiations between the State of Maryland, the City of Baltimore and the Maryland Historical Society resulted in the collections being turned over to the state in April of 2018. The MAC Lab has already begun to make the collections available to the public. A sample of artifacts from the Clagett Brewery Site was on display during Jefferson Patterson Park and Museum’s Discovering Archaeology Day event on April 21st and they were also popular with the Archaeological Conservancy tour of the lab. Over the next several months, artifacts from the collections will begin to be added to the Diagnostic Artifacts in Maryland website and also to Maryland Unearthed, a website that allows the public and researchers to learn more about the collections at the lab. For more information about this collection or the work of the Maryland Archaeological Conservation Laboratory, please contact patricia.samford@maryland.gov. Author’s note: This is a slighly updated version of the original article with a few factual errors corrected. With a Certified Local Government grant from the Maryland Historical Trust, the Cumberland Historic Preservation Commission and staff have partnered with Braddock Middle School to develop a first-ever Youth Summit. During the 2015-2016 school year, this project is bringing together local youth, educators, and preservation partners to investigate and engage with historic places in our city. The summit will give participating students real-world experience with a day focused on hands-on preservation maintenance and intensive sessions on using architecture as artifact, archival research, and place-based interpretation. Summit participants will visit, discuss, and analyze designated historic sites such as churches, the C&O Canal, and the Footer Dye Works Building. The students will craft stories about these places for their peers and the community at large. Project partners include the City of Cumberland’s Historic Preservation Commission, Allegany College of Maryland, the National Park Service C&O Canal National Historical Park, and Canal Place Preservation and Development Authority. Several Maryland state agencies have come together to work collaboratively to increase the ability of buildings and infrastructure to withstand the damaging effects of natural hazards and climate change. The Maryland Resiliency Partnership is comprised of the Department of Natural Resources, the Maryland Department of the Environment, the Maryland Emergency Management Agency, the Maryland Historical Trust, and the Maryland Environmental Service. All five agencies are working together to leverage funding, personnel, and projects to support efforts that integrate floodplain management, hazard mitigation, and coastal resiliency. The Maryland Association of Floodplain and Stormwater Managers 11th Annual Conference held on October 15, 2015 in Linthicum, Maryland was the perfect opportunity to promote the Maryland Resiliency Partnership. Kevin Wagner of the Maryland Department of the Environment and I co-presented a paper on historic structures and flood mitigation, after which several Maryland Resiliency Partnership members took the stage to participate in a mitigation showcase. The showcase featured information on how to use the Maryland flood insurance rate maps to assess, plan for and mitigate flood risk to historic and non-historic buildings, and infrastructure. Recently, the Maryland Department of the Environment coordinated flood risk outreach workshops in Crisfield and Smith Island with several local, state and federal partners. All of the Maryland Resiliency Partnership members were on-hand to provide residents with additional information on grant programs and flood mitigation best practices, like elevating houses above the predicted flood water level. Look for information coming soon to our Facebook page on upcoming Maryland Resiliency Partnership workshops. This year, the National Trust for Historic Preservation’s annual conference, PastForward, kicks off a celebration of the 50th anniversary of the National Historic Preservation Act with educational opportunities, Field Studies and networking events. 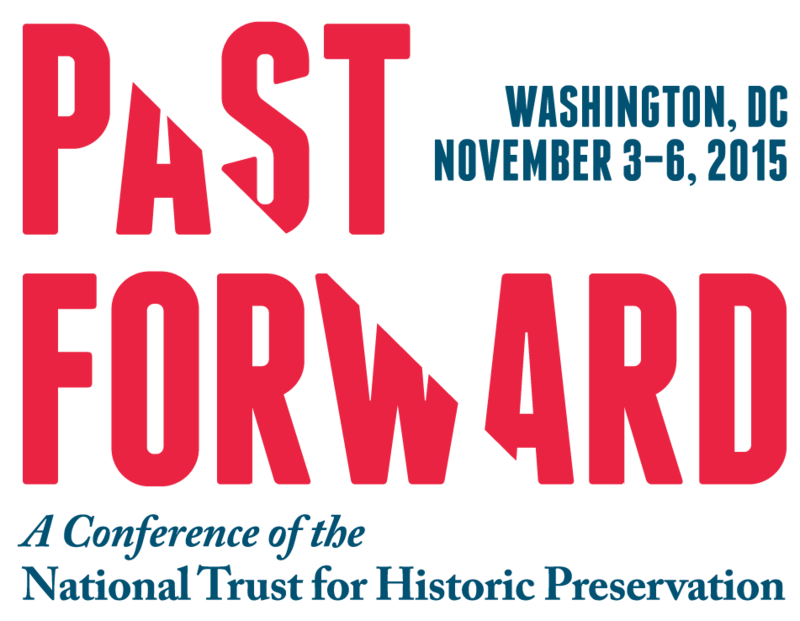 PastForward, to be held Nov. 3-6 in Washington, DC, will convene the diverse and expansive constituency of preservation players in the nation’s capital, from individuals to elected officials, federal agencies to architects, scholars to activists. Online registration closes on Friday, Oct. 30 — after that date, preservationists can register onsite. For more information, visit http://www.PastForwardConference.org. Core conference programming provides focused education and new ideas in order for attendees to elevate the role and expand the meaning of their preservation work within their communities. Programming this year emphasizes urban strategies, federal innovation and excellence, and telling a more inclusive story by featuring multiple voices and experiences. Finally, we will launch a rich and engaging discussion about the future as we approach the 50th anniversary of the National Historic Preservation Act. Back again this year are the four marquee PastForward presentations, TrustLive. Launched at last year’s conference in Savannah, not only did the TrustLive presentations draw record numbers (including overflow seating in an additional theater for the first TrustLive), but more than 800 virtual sites tuned in live from around the world to participate. Viewing parties with more than 30 attendees participated virtually and joined the discussion on Twitter, expanding these discussions to reach a much broader and more diverse audience. Virtual attendance during the TrustLive presentations is free and open to the public. The first TrustLive, preservationFUTURE, looks ahead to the next 50 years, including how we can adapt and grow to respond to the ever-changing landscape of the movement. 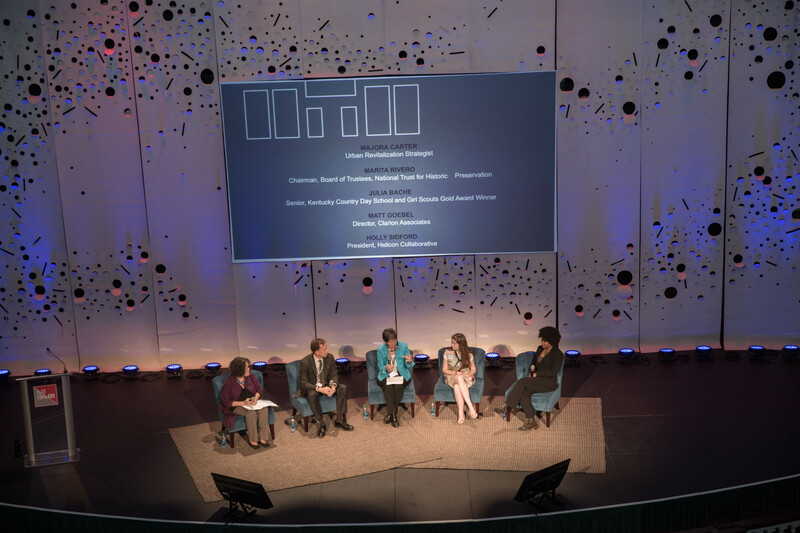 At preservationVOICES, sponsored by the National Park Service and the Kellogg Foundation, you will hear from those using place to seek justice, foster inclusivity and tell the full American story. Sponsored by The 1772 Foundation, preservationURBAN explores the tools and solutions to take preservation to scale in our downtown communities, with particular focus on property redevelopment, creative financing and Main Street approaches. Finally, the last TrustLive, preservationINNOVATION, brings the work of federal agencies into the spotlight, as these agencies play a critical role in the stewardship of our nation’s heritage and are often on the front lines of innovation. This TrustLive is sponsored by Advisory Council on Historic Preservation, General Services Administration and US Department of Agriculture, Animal and Plant Health Inspection Service. 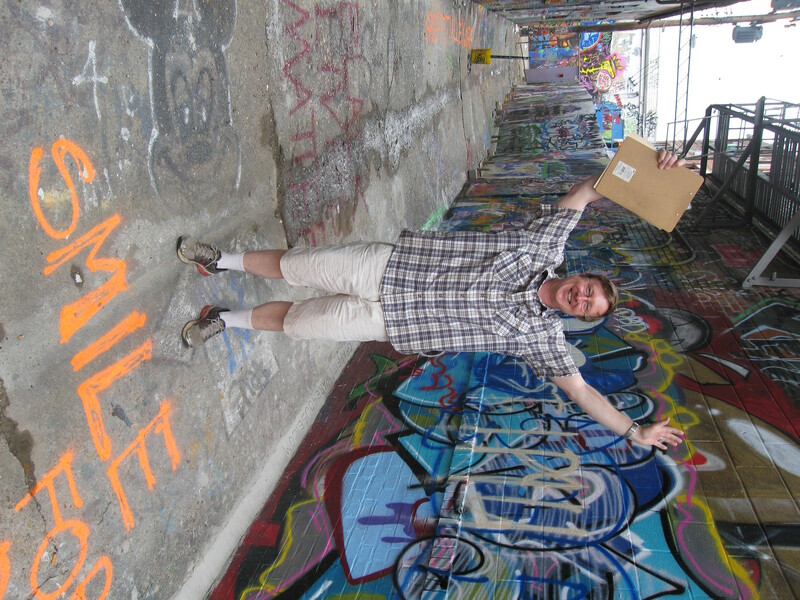 In addition to educational sessions and TrustLives, Field Studies highlight preservation in the host city, sending attendees into the field to explore local preservation projects and connect with the people who are defining preservation within the local community. Since we’re in Washington, DC, this year, attendees are afforded the opportunity to explore not only the host city, but also get to learn from local efforts in Virginia and Maryland through these half-day and day-long activities. This year Field Studies explore the intersection of arts and preservation in Baltimore and learn from the stories of Maryland Rosenwald schools. It’s apparent that attendees are excited to explore the DC metro area as many Field Studies are already sold out. PastForward isn’t all about education and training—networking is a key component to the conference, and the number one networking event is the opening reception. Not only does the reception follow the first TrustLive, preservationFUTURE, but it serves as the venue to celebrate the National Historic Preservation Act and the Historic Tax Credit. This year, the Opening Plenary and Reception take place at DC’s beloved treasure, Washington National Cathedral. This is a special experience for attendees to spend time in a spectacular historic treasure, not just to the city of DC but the entire nation. If you can’t make it for the entire conference, there are several one day options that are ideal for local preservationists. From one day conference passes to day-long, skill-building Preservation Leadership Training (PLT) Intensives to a morning focused on inclusivity in preservation, there are conference options to fit any schedule. The PastForward Diversity Summit also has free programming that’s open to the public. The Conversation and Panel Discussion on Organizational Leadership and National Partnership (Wednesday, November 4, 9:00-10:15 a.m.) will start a powerful discussion on how we must work together to engage more communities of color, women and the LGBTQ community to preserve the places that tell the full American story. We hope you will join us at PastForward 2015! New Bald Friar Petroglyph Exhibit a Must See! 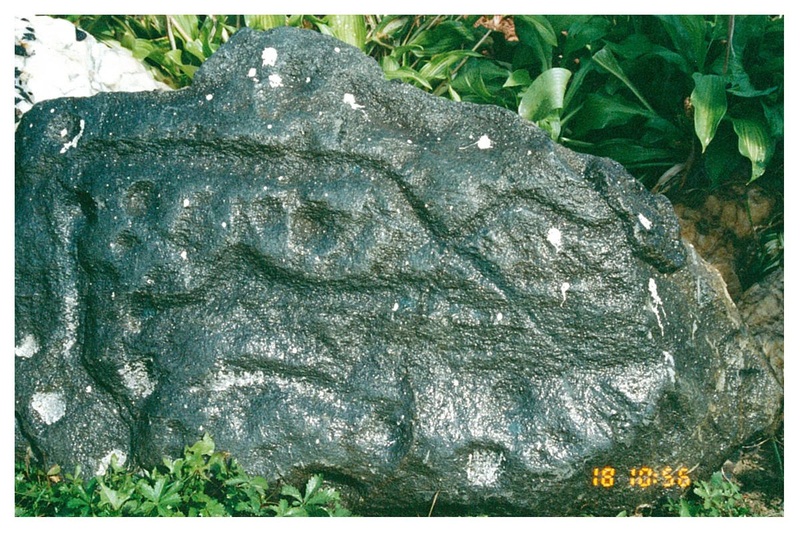 A close-up of one of the petroglyphs removed from its original location in the Susquehanna River. From simple pecked cups, to grooved parallel lines, to complex diamond shapes and curvilinear compositions, the Susquehanna River’s Bald Friar petroglyphs have generated interest – and mystery – for hundreds of years. Native Americans originally carved the abstract images into large, island-sized boulders between what is now the Pennsylvania line and the Conowingo Dam. 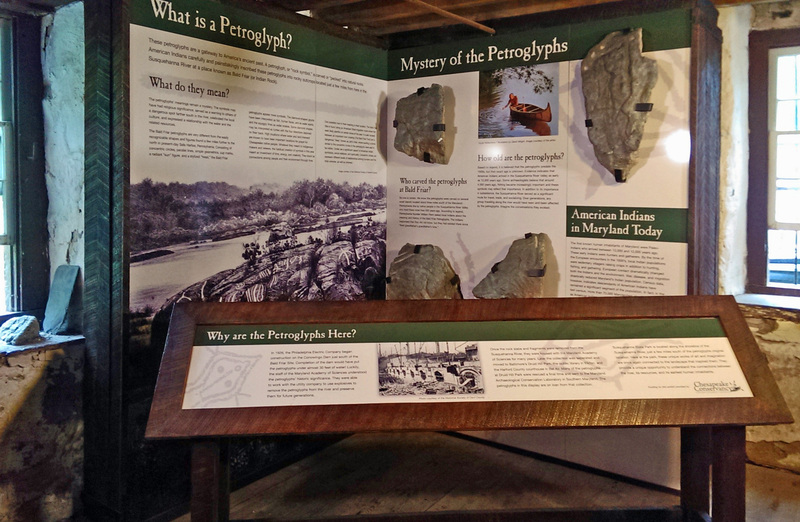 In 1927, the petroglyphs were removed from their location to save them from inundation from the dam, after which the Maryland Academy of Sciences cemented together the fragmented stones for exhibition. No one knows the precise age or meaning of the petroglyphs. Now, in the historic Rock Run Grist Mill within view of the Susquehanna River, a new exhibit at Susquehanna State Park features some of the enigmatic artifacts, coupled with interpretative text. The exhibit is not large, but it deftly covers the mysterious history of these images carved in rock, as well as the more recent journey they have taken. The Bald Friar Exhibit at Susquehanna State Park. Spurred in part by a desire to present a more comprehensive picture of the Bay region and Native peoples, the Chesapeake Conservancy brought together the Maryland Department of Natural Resources to house the exhibit and the Maryland Historical Trust to execute a loan for the artifacts. Financing for the design and fabrication of the exhibit was provided by Turney McKnight, a member of the Chesapeake Conservancy’s Board of Directors. Turney has a deep and manifest interest in the petroglyphs, and his generosity (and good humor) literally took this exhibit from a great idea to a terrific product. Although no one fully understands the Bald Friar petroglyphs, they were not randomly or casually positioned on the landscape. Placed between the lowest ford and the deepest “sink” within the falls of the Susquehanna River, their meaning must have been connected to that place. We may never know who made the images or when, or for whom the message was intended. We can be sure, however, that by bringing some of the petroglyphs to the bank of the Susquehanna River – only about 6 miles from their original location – Turney McKnight and the Chesapeake Conservancy have returned them to the place where that message resonates best.